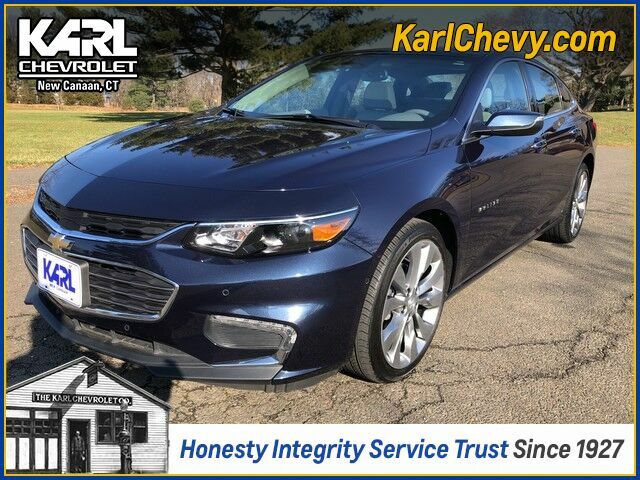 This former GM Executive Driven 2018 Chevrolet Malibu Premier is offered to you for sale by Karl Chevrolet. This Malibu Premier has it all including 2.0 Liter Turbo Engine, Navigation, Power Sunroof, Bluetooth, Apple CarPlay, 19 inch Alloy Wheels, full safety package including Front and Rear Park Assist, Forward Collision Alert, Side Blind Zone Alert, Lane Keep Assist, Rearview Camera with Cross Traffic Alert, Remote Start, and so much more. Awesome looking in Blue Velvet Metallic with Medium Ash Leather Interior. This top-of-the-line Premier model offers an outstanding value! This Chevrolet includes: TRANSMISSION, 9-SPEED AUTOMATIC (STD) A/T 9-Speed A/T WHEELS, 19" Aluminum Wheels LANE KEEP ASSIST Lane Departure Warning Lane Keeping Assist BRAKE, PARKING, ELECTRONIC BLUE VELVET METALLIC EMISSIONS, CONNECTICUT, DELAWARE, MAINE, MARYLAND, MASSACHUSETTS, NEW JERSEY, NEW YORK, OREGON, PENNSYLVANIA, RHODE ISLAND, VERMONT AND WASHINGTON STATE REQUIREMENTS UNIVERSAL HOME REMOTE Universal Garage Door Opener DRIVER CONFIDENCE PACKAGE II Automatic Parking Rear Parking Aid Adaptive Cruise Control Cruise Control SIDE BLIND ZONE ALERT WITH LANE CHANGE ALERT Blind Spot Monitor ENGINE, 2.0L TURBO DOHC 4-CYLINDER SIDI 4 Cylinder Engine Gasoline Fuel Turbocharged CRUISE CONTROL, ADAPTIVE, FULL RANGE Adaptive Cruise Control Cruise Control AUTOMATIC PARKING ASSIST Rear Parking Aid STANDARD PAINT PREMIER SUN AND WHEEL PACKAGE Tires - Front Performance Aluminum Wheels Universal Garage Door Opener Floor Mats Generic Sun/Moonroof Tires - Rear Performance Sun/Moonroof TIRES, 245/40R19 ALL-SEASON, BLACKWALL Tires - Front Performance Tires - Rear Performance BRAKING, FRONT PEDESTRIAN AUDIO SYSTEM, CHEVROLET MYLINK RADIO WITH NAVIGATION AND 8" DIAGONAL COLOR TOUCH-SCREEN, AM/FM STEREO Smart Device Integration Navigation System AM/FM Stereo Bluetooth Connection Auxiliary Audio Input MP3 Player FOLLOWING DISTANCE INDICATOR PREMIER PREFERRED EQUIPMENT GROUP HEADLAMPS, INTELLIBEAM, AUTOMATIC HIGH-BEAM SUNROOF, POWER, TILT-SLIDING Universal Garage Door Opener Generic Sun/Moonroof Sun/Moonroof REAR CROSS-TRAFFIC ALERT Cross-Traffic Alert FORWARD COLLISION ALERT FRONT AUTOMATIC BRAKING Brake Assist FORWARD AUTOMATIC BRAKING, LOW-SPEED DRIVER CONFIDENCE PACKAGE Lane Departure Warning Lane Keeping Assist Rear Parking Aid Blind Spot Monitor Cross-Traffic Alert FRONT AND REAR PARK ASSIST Rear Parking Aid SEATS, FRONT BUCKET (STD) Bucket Seats DARK ATMOSPHERE/MEDIUM ASH GRAY, PERFORATED LEATHER-APPOINTED SEAT TRIM Leather Seats *Note - For third party subscriptions or services, please contact the dealer for more information. * This 2018 Chevrolet Malibu comes with a CARFAX Buyback Guarantee, which means you can buy with certainty. With its full CARFAX one-owner history report, you'll know exactly what you are getting with this well-kept Chevrolet Malibu. As a Certified Pre-Owned vehicle, this Chevrolet Malibu Premier offers you the peace of mind because you know it has been rigorously inspected to meet exacting standards. This vehicle was engineered to be both economically and environmentally friendly with exceptional fuel efficiency. Marked by excellent quality and features with unmistakably refined leather interior that added value and class to the Chevrolet Malibu Left your phone at the restaurant? No problem. With the navigation system on this Chevrolet Malibu, you'll be able to quickly find your way back to get it. With all records included, drive away confidently knowing the complete history of this Chevrolet Malibu Premier. As always, our goal here at KARL Chevrolet is to assist you to find the perfect vehicle to meet your needs. While we strive to have the area's best selection of quality pre-owned vehicles in stock at all times, we know there are times when a customer may have very specific needs. If you have a specific model or features that you are searching for, please let us know. You might be surprised at how quickly we can find a match! Just another KARL Advantage .... finding you the perfect vehicle at the best overall value. Thank you for the opportunity to assist in your vehicle search.